IBM, the global technology giant, showcased an artificial intelligence (AI) project that is designed to make logical arguments with humans at an event held at IBM’s Watson West site in San Francisco on Monday. 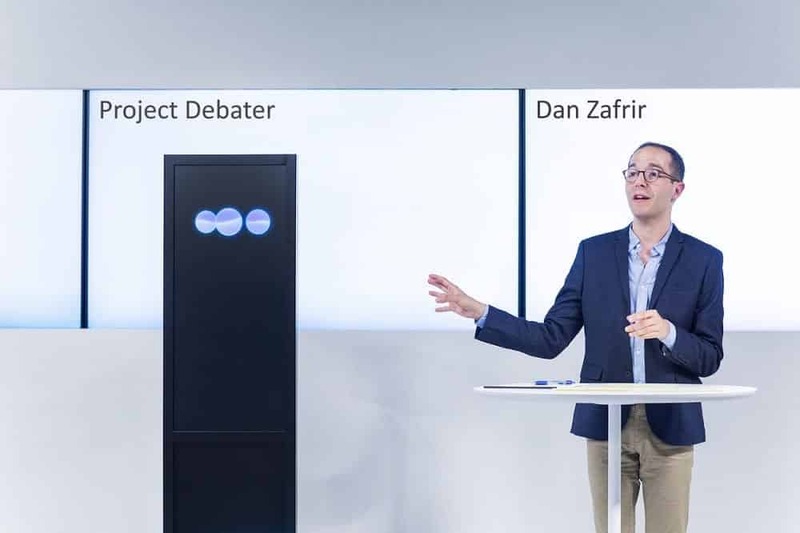 Known as ‘Project Debater’, a champion debater and IBM’s AI system, the company has been developing the AI’s capabilities over the past six years, which includes data-driven speech writing and delivery, listening comprehension for identifying key claims made within a speech, and the ability to formulate principled arguments. The company has been staging in-house debates between humans and Project Debater for the past two years, said IBM Research principal investigator and creator of Project Debater Noam Slonim. However, it was the first ever such live public demonstration of a live debate between humans and IBM’s AI system. For those unaware, IBM has a long list of major AI innovations, which also include “Deep Blue,” the IBM system that took on chess world champion Garry Kasparov in 1997, and IBM Watson, which beat the top human champions on Jeopardy! in 2011. Debater’s answers come from access to hundreds of millions of journal and newspaper articles. The Project Debater had to compete with two human participants, Dan Zafrir, president of the International Debate Society in Israel, and Noa Ovadia, 2016 National Israel debate champion. The opening debate topic was “we should subsidize space exploration”, followed by “we should increase the use of telemedicine”. Both topics were selected from a larger list of potential questions, and besides a brief introduction, none of Debater’s arguments were pre-arranged, IBM said. For each of these two short debates, both sides had to deliver a four-minute opening statement, a four-minute rebuttal to the other’s argument, and a two-minute closing statement. While Project Debator during the first debate with Ovadia in terms of the amount of knowledge it delivered, it however lost to Ovadia, as she was judged the winner by the crowd of journalists in “delivering” the argument. In the second debate with Zafrir, the audience found the AI to be more persuasive than him, which saw the Project Debator winning over nine members of the audience of about 40 in its argument in favor of telemedicine, effectively beating Zafrir. The AI also managed to crack a relevant joke or two in the process. What is impressive is that Project Debater doesn’t try to build an argument based on an understanding of the subject in question, but instead listens and comprehends and then forms argument by combining elements of previous arguments along with relevant points of information from Wikipedia. Despite this, the AI had several robotic slip-ups, where at times the Debater could barely draw upon relevant data to make a point. With IBM displaying that AI can involve in debates with humans and present their point of view, does this mean that it is going to take over humans and their jobs. Probably not. While there is no doubt that AI can help humans in accessing and analyzing big amounts of data quickly and more efficiently, but it certainly has a long way to go. Chris Reed, a professor at the Centre for Argument Technology at the University of Dundee, who attended the debate believes that the demonstration showcases the limitations of AI. “It helps the public understand where the state of the art is, which means panics about the imminent robot apocalypse might be tempered a little bit,” he said.